Human aging is a complex phenomenon that results from environmental, genetic, and epigenetic events in various cell types and tissues. A prominent feature of aging tissues is inflammation. This process is referred to as inflammaging and is a high significant risk factor for both the diseased state and death of elderly people. However, the etiology of inflammaging and its causal role in unfavorable health outcomes is yet to be determined. Why explore the relationship between aging and inflammation? Different phenotypes of aging are associated with and can be predicted by elevated levels of biomarkers such interleukin-6 (IL-6). This inflammatory biomarker is present in states of mild inflammation and can be used to foretell many age-related phenotypes such as alterations in body composition, energy production and utilization, metabolic homeostasis, and neuronal health. Identifying pathways that control age related inflammation may shed light onto whether treatments that modulate inflammation could benefit elderly. Acute inflammation. The acute inflammatory response is vigorous within the first few hours or days but then gradually declines. Acute inflammation is beneficial as it induces an immune response and facilitates the healing, replacement, and adaptation of various tissues to conditions that may be detrimental such as tissue damage or intrusion of pathogenic microorganisms. Chronic inflammation. Chronic inflammation has many features of acute inflammation, but it is not related to the duration of the inflammatory response. A persuasive feature of aging is chronic inflammation, which often results in tissue deterioration. Figure 1.0. 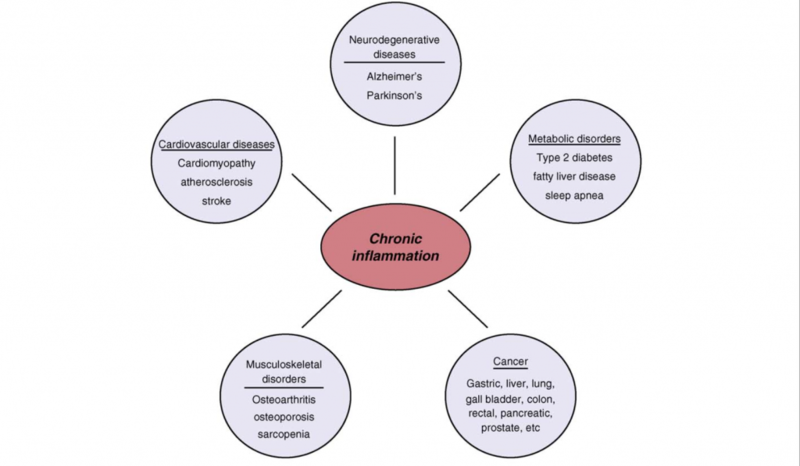 Chronic Inflammation associated with age related diseases. Chronic inflammation lies at the root of heart disease, cancer, osteoporosis, Alzheimer`s disease, diabetes and various other age-related diseases. Retrieved April 9, 2018. Source: Inflammatory networks during cellular senescence: causes and consequences. Trends in Molecular Medicine. 2010. The accumulation of cellular debris. As we get older, our body`s ability to eliminate cellular debris decreases significantly. This natural process continues as we age and cellular debris often builds up. These molecules are then processed by a network of sensors, such as the Nlrp3 inflammasome. The Nlrp3 inflammasome network labels the cellular debris molecules as “dangerous” and initiates an immune reaction that what will facilitate physiological repair. However, as cellular debris and damage increases, the responses can become chronic and hence maladaptive. Gut or oral microbiota. Harmful products produced by the human body, such as oral or gut microbiota, may spill over into nearby tissue and circulation. As we age, the liver’s ability to isolate these microbes and their product significantly decreases and it may result in chronic inflammation. Cell senescence. Senescent cells are associated as being the driving force behind aging and age-associated pathologies through their secretory phenotype. Mechanistically, senescent cells secrete numerous pro-inflammatory cytokines that modify the environments of tissues and the functions of neighboring cells. As we age, senescent cells accumulate and become abundant at the locations of various age-related pathologies. This aspect was demonstrated by a study that found the elimination of senescent cells in prematurely aged mice prevented many several age-related pathologies. 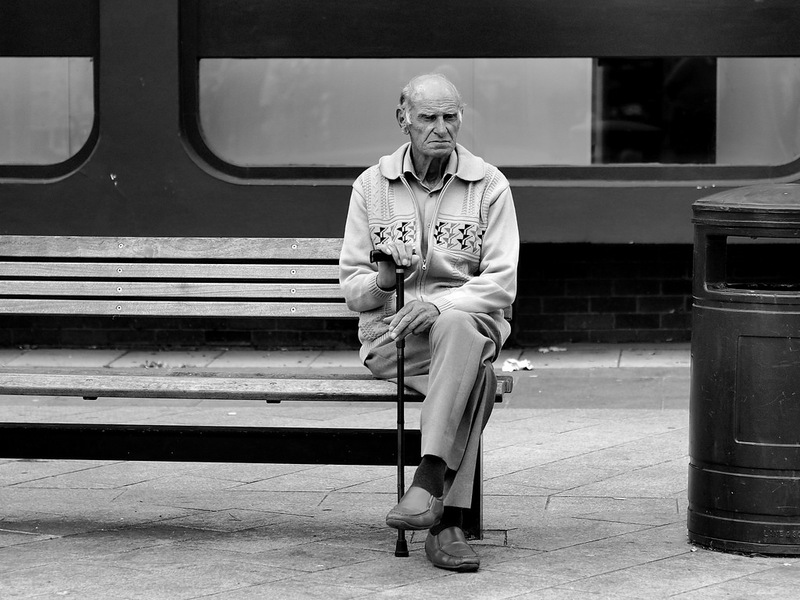 The natural process of ageing likely causes changes in the immune system. Previous studies have found that the responses of adaptive immunity decrease as we age, whereas innate immunity experiences less drastic changes that may result in hyperactivity. Cytokines are immunomodeling agents and are important features of chronic inflammation. Cytokines act as signaling molecules that aid cell to cell communication in immune responses and stimulate the movement of cells towards sites of inflammation, infection and trauma. Generally, cytokines bind to cell surface receptors and this commences an intracellular signaling cascades that ultimately activates transcription. Among this process, transcriptional factors, such as the proteins NF-κB (nuclear factor kappa-light-chain- enhancer of activated B cells) and STAT-3 (signal transducer and activator of transcription) regulate inflammation across several diseases and tissues. NF- κB regulates genes that code for inflammatory cytokines as a previous study has found that NF-κB regulates the majority of genes that comprise the SASP. Additionally, NF-κB is a caustic factor in several aging phenotypes, particularly in the skin, spine, and brain Additionally, the activation of STAT-3 is emerging as a crucial mediator in inflammation as most proinflammatory agents have been shown to activate this factor. In regard to age related pathologies, IL-6 is a significant cytokine as it possesses a strong chronic inflammatory component. IL-6 mediates its effects through the activation of the STAT-3 pathway and is used a trademark of chronic morbidity. Further examples of cytokines that stimulate an immune reaction and elevate across multiple age-related diseases include IL-1β and tumor necrosis factor-α (TNF- α). Figure 2.0. 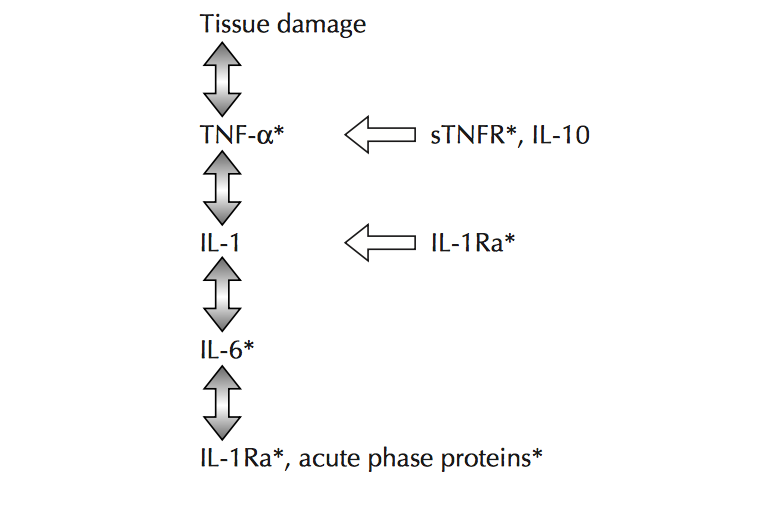 The inflammatory cascade including early mediators/proinflammatory cytokines TNF- α, IL-1β and distal mediators IL-6. Retrieved April 4, 2018. Source: Aging and inflammatory cytokines. Current Opinion in Hematology. 2001. Medical advances that not only understand the characteristics of chronic inflammation, but also provide mechanisms to prevent and suppress chronic inflammation, have high potential for handling and/or preventing varying age-related pathologies. Anti-inflammatory interventions, such as the use of low dose aspirin, are already popular in clinical use. Further, considering the close relationship between adipose tissue and inflammatory response, interventions aimed at controlling obesity may be helpful as obesity provides a reservoir of inflammatory reactions. Similarly, a previous study has suggested that increasing levels of exercise may lower morbidity by lowering chronic inflammation. Recent studies are also manipulating cell senescence. In particular, one study has found that eliminating senescent cells hold promise for lessening chronic inflammation as the elimination of these cells in a mouse model improved several age-related pathologies. Inflammaging describes the low-grade chronic inflammation in aging and is a high significant risk factor for both the disease state and death of elderly people, however, preventative and curative measures may be taken. While acute inflammation may be beneficial as a fundamental immune response to damaging intracellular situations, chronic inflammation is often low grade and perpetual and results in tissue damage. Additionally, many stimuli activate inflammaging and there is the coming together of basic mechanisms and pathways such as activation of NF-κB and Nlrp3 inflammasome. However, little information is known about how these mechanisms/pathways are common amidst different organs and cell types as well as among age-related diseases. Forthcoming studies aimed at reducing chronic inflammation by senescent cells hold great promise for future treatment modules. This work by Leena Panaich is licensed under a Creative Commons CC-BY Attribution 4.0 International License.